So Pizza Hut has decided to release a new line of "cheap" pizzas called "Pizza Mia". These pizzas are following in the footsteps of popular promotions from both Domino's and Pizza Hut, where they offer $5 pizzas when you order 3 or more. When Pizza Hut first had this promotion, they sold their standard hand tossed pizza, 3 for $15. This pizza was not as good as their original pan pizza, but it was still pretty good. Well apparently Pizza Hut thought they were losing too much money by doing this. So instead of making their prices slightly higher and standing by the quality of their pizza, they came up with a new pizza, made of cheaper ingredients and dubbed it the "Pizza Mia". 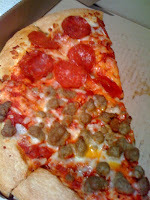 I was excited to try their new pizza because I am usually pretty impressed with whatever pizza hut comes up with. 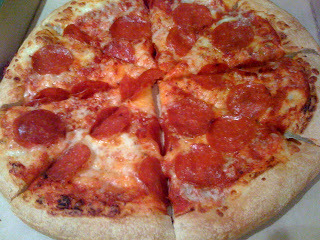 After trying this pizza though, I wish that I had paid the extra money and gotten their original pan pizza. This pizza was awful. 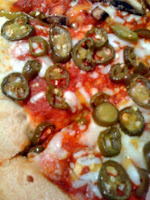 The dough was dry and tasteless and the sauce was overly sweet. The cheese was barely even there. The only thing that was acceptable about the pizza was that they actually gave you a respectable amount of toppings. The taste of this pizza reminded me of being a little worse than the worst frozen pizza I have ever had. I thoroughly enjoy those cheap little $1 frozen pizzas more than I enjoyed this Pizza Mia. After forcing down a couple slices of this awful pizza, I surrendered and filled up on Quepapas instead. Thankfully Pizza Hut has continued to make their Quepapas taste delicious. For those of you that haven't tried them, well shame on you. 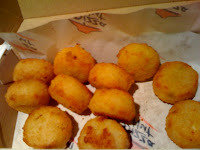 They are like little nuggets of mashed potatoes with cheese and jalapenos mixed in, fried to a golden brown. Mmmmmmmmmm. So in short, stick to the regular pan pizza and Quepapas if you're going to go to Pizza Hut, avoid the Pizza Mia at all costs.